It was at the very end of August that we first introduced our children to the interrupt rule. It took them (and us) just a couple of weeks to master the concept, and within a month they had it down pat. As a follow-on, I’ve found myself speaking to the girls recently about their habits of pointing at interesting people when we’re out and about. They like to call brown people “brown persons” and point out interesting tattoos or people talking in other languages. It hasn’t been too embarrassing so far, but I pulled this book out of our collection in order to reinforce some basic principles of manners. I'm not sure this is the be-all and end-all of books about manners, but it's certainly a good one to use to introduce the concepts to children. Aliki’s book Manners is a bit like a magazine. It contains a mish-mash of illustrated pages — some pictures take up the whole page, others are a comic strip scenario. 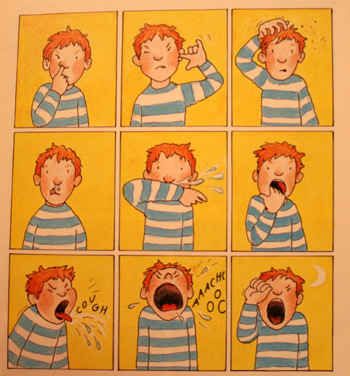 Aliki knows children well and can faithfully mimic their poor manners in her simple, clear illustrations. 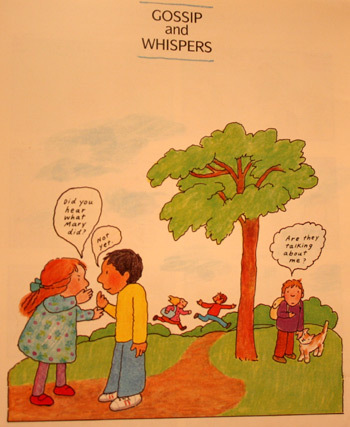 The section covering gossip and whispers illustrates the idea that whispering publicly is not polite because others may think they are being gossiped about. This cute pair of characters act out several different scenarios, teaching each other manners and having fun with the role-play. It's easy for kids to relate to and encourages more pretend-play along similar lines. 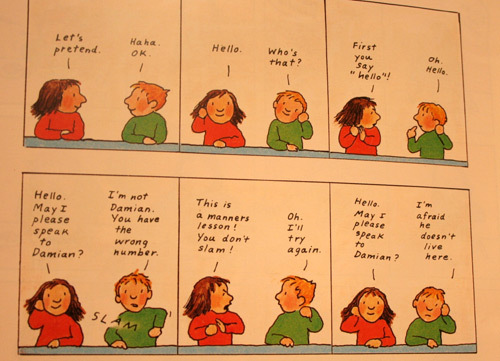 Manners covers a range of topics, from physical demeanour to verbal niceties. All are presented simply, and my girls have quickly picked up on the manners. I notice it in their play as well as when we’re out. Now Brioni begs me to bend down for a secret and whispers into my ear: “I saw a brown person”. 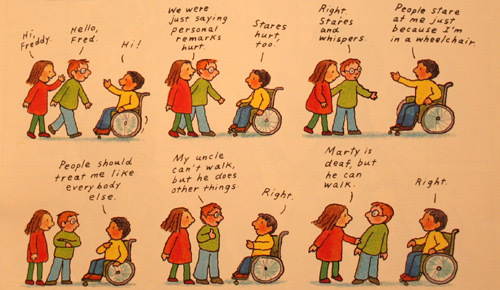 I really like the way this book handles the issue of physical differences. It normalises the differences and ends in a similarity: "We can't help it if we're nice anyway!" Manners can be tricky things. They can be difficult to define, and some are purely cultural. (Even in our almost-same-culture marriage, David and I differ in what we consider “good” and “bad” manners.) 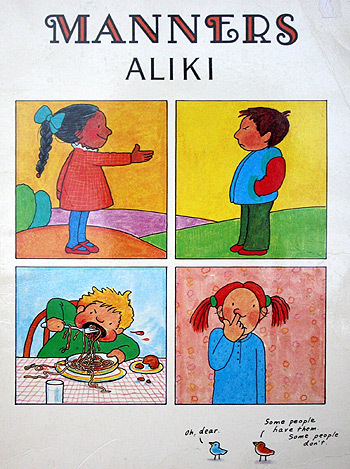 But Aliki’s book is definitely a good starting place for the conversation that you’d better have before it’s too late. "Look at Daniel. Don't you wish you didn't have to?" What about you? Do you have a good book on manners for your children? More recently... Why is church so dull? Both of those books would be perfect for what I’m teaching in Health at the moment at school. Thanks for the heads up. I’m fascinated to hear that you are sworn off internet purchases this year! Did you have a bad experience, have you been persuaded by David, or is this an exercise in self control??! I don’t buy lots from the net, but I think I might find that one a little hard. I take comfort knowing that when we move to Wellington, and are so far away from places that I will still be able to get something on line if I ‘need it’! You are a very disciplined person, so I’m sure you will cope very well with your resolution. We have introduced the interrupt rule! So far the kids have been very excited which is quite hilarious! Hopefully we will see some good results. For the most part they are very good BUT what do you do when say you are on the phone and suddenly the background noise reaches fever pitch? Technically they aren’t interrupting per say but it IS an interruption. Make sense? While on the phone, if the noise gets too much, I put up my hand in a STOP position, and the kids know to tone it down. (Granted, I am rarely on the phone. I use it probably a couple times a month.) I also do this if they interrupt improperly, so I’m not actually speaking to them and giving them the attention they’re seeking. I had to inform my kids that the interrupt rule also applied to when I was signing with my Deaf friends. Even though I wasn’t speaking aloud, I was still in conversation, and the children needed to learn to interrupt the right way. I do the stop sign too! I was just wondering if that was appropriate or not. The children are improving. They weren’t really bad. If anything their “struggle area” would be how they receive the “no”. I reaaaaally don’t like whinging!